Get ready to fall in love with "Alex & Me"
Soccer superstar Alex Morgan scores her movie debut with Warner Bros. Home Entertainment in the full-length feature film "Alex & Me" on Blu-ray™ & DVD June 19. Also featuring Nickelodeon star Siena Agudong (Nicky, Ricky, Dicky & Dawn and the upcoming Star Falls), the film follows the uplifting story of a young female athlete who learns how you need passion, determination and self-worth to make all your dreams come true. 1 - copy of "Alex & Me"
To enter you must be subscribed to my YouTube channel: Thisfunktional and follow instagram.com/Thisfunktional and email me your full name and mailing address with the subject line #ThisfunktionalContest #AlexAndMe to Thisfunktional@Gmail.com. Disclaimer: Winners will be chosen. Contest runs to July. 01, 2018 11:59 p.m. PST. No purchase necessary. Prize provided by Warner Bros. Home Entertainment. Only open to the U.S., no PO Boxes or international addresses. Only one entry per household. Entries on behalf of another person will not be accepted and joint submissions are not allowed. We will not accept entries of contestants who have claimed a prize in the last 6 months. 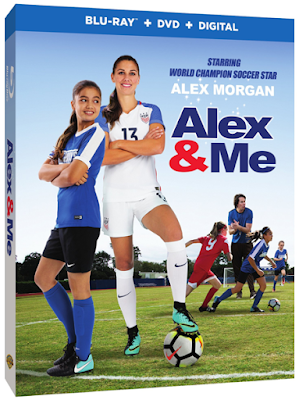 Teenager Reagan Willis (Agudong) has one dream – to play soccer like her hero, Alex Morgan. Her bedroom is a shrine to all things Alex, including a life-size poster of the Olympic gold medalist. Yet in the Willis house, Reagan lives in the shadow of her prep football superstar brother Logan. When Reagan fails to make the cut of the premiere local soccer club team and is humiliated by her rival Claire, she’s certain her ship has sailed. But after accidentally hitting her head, Reagan’s poster of Alex Morgan suddenly comes to life and everything changes. An Olympic Gold Medalist and FIFA Women’s World Cup champion with a penchant for goal scoring, Alex Morgan is one of the top soccer players on the planet, currently playing forward for the United States Women's National Team and the Orlando Pride of the National Women's Soccer League. Away from the field, Morgan is also an accomplished author of “The Kicks” series, a collection of chapter books filled with wonderful messages of empowerment for young girls. The first The Kicks book, “Saving the Team,” debuted at No. 7 on the New York Times Best Seller list. Eric Champnella (Thunderstruck, Mr. 3000, Eddie) wrote the Alex & Me screenplay and is also making his full-length feature debut as the film’s director. Alex Morgan serves as co-producer. Producers are Mike Karz (Blended) and William Bindley (Mother’s Day). Todd Williams (The Illusionist) is the executive producer. Jerry Trainor (iCarly) also stars as Nigel, a less-than-reliable youth soccer coach, alongside Matt Cornett (Bella and the Bulldogs) as Reagan’s brother, Logan; Colin Critchley (Legends of the Hidden Temple) as Reagan’s soccer-playing pal, Ben; Chuiti Tiu (Nashville) as Reagan’s mother, Ann Wills; and Jim Klock (True Detective, Scream Queens) as Reagan’s father (and biggest fan), Joe Wills. Jessica Treska (HBO’s upcoming Sharp Objects) plays Reagan’s arch-rival, Claire.